Personal Note: “I am a huge fan of what I call “Design on a Budget”. After giving you tips and tricks to reorganize your closet, today I will show you how to make your own beautiful storage containers from shoe boxes. This is the first post in the new Craft series. Make your own beautiful Boxes – Design on a Budget! Recycle old shoe boxes, wooden wine crates or other cardboard boxes, cover them with stylish gift wrap, colour coordinated decorative papers, patterned wall paper or newspaper prints, depending on the style, theme or colour scheme in your newly organized closet. If you buy gift wrap sheets (I like to use standard sheets, approx. 68x50cm, which fit one box, if the inside is not fully covered and it has no lid) look for great designs, same colours in different patterns, one colour in different hues, white or black in different textures or just the same paper for lots of boxes. Find papers that you really enjoy. 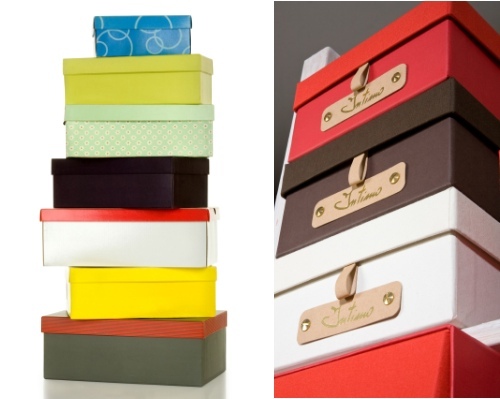 Ask your local shoe shop for empty boxes, recycle your own or use other empty boxes in good sizes to fit your closet. If you have a dark box and light paper, it is a good idea to give the box a coat of primer or white Acrylic paint and let dry properly before you cover it with paper.If unsure, what size paper you need, wrap a piece of newspaper around your box, cut to size and measure. That gives you the minimum sheet size you need. If you go for expensive Designer papers, think of covering only the outer sides and paint the inside with acrylic paint first. Test pots of Acrylic Interior paints are perfect for the job, as they come in hundreds of colours, perfect for matching to your paper and they are not expensive). Or you can use a plain colour matching paper for the inside and the designer paper for the outside. If you only cover the outside, still fold the paper over the top edges of the box to the inside (min. 1- 2cm). (1) Cut your paper to fit around the box on all sides. Cut a separate piece (you might need a second sheet of paper) for the inside bottom of the box 5mm smaller than the dimensions of the box outer bottom. If your box has a lid, first cut the paper to fit the top, the sides and the inside sides of the lid. Then cut an extra piece for the inside of the lid top 5mm smaller than the outer top. (2) With a long ruler and a pencil, make two thin lines, corner to corner, on the wrong side of the large paper sheet to find the exact center. Or mark half of the length and half of the width and find the center point. Do the same on the bottom of your box and mark the middle with a tiny needle hole. (3) With the needle in the hole of the bottom, try to find the middle of the paper and place the box on top. Gently outline the bottom of the box on the paper. (4) Take the box off, cover the bottom of the box with glue (stick or spray adhesive) and place it on the marked paper rectangle. (5) Turn over and rub down the paper carefully with an old plastic card to bond and prevent wrinkles. Run the card along the paper down the edges of the box (This helps prevent pockets from forming along this edge after the paper is folded over). Be careful not to damage your beautiful paper. (6) Apply the adhesive to one of the long sides of the box and fold up the paper. Again run the plastic card over it. With scissors cut straight down to the top of the box at both corners. Repeat on the other long side of the box. (7) Fold the two ends of the paper for the short sides of the box into triangles to create nice edges of the paper. (8) Cut the triangles off about 2 cm from the folding line, then glue the folded stripe to the inside of the paper. Apply adhesive to the short side of the box, fold up the paper and run the plastic card over it. Do the same on the opposite side of the box. (9) Take the box, so that the first paper triangle lies flat on your table and apply glue to the paper triangle. (10) Make a nice corner, by folding the paper up and rub it to the box with your plastic card. Do the same on all corners. By now you have covered the bottom and all four sides of your box. (11) Cut the paper in all corners straight down to the top of the box. (12) Lay each side of the overlapping paper flat on your work surface and with a ruler draw a line on the inside (take your shortest paper piece as the maximum with). (13) Then cut all four sides nicely with scissors or a craft knife to the same length. (14) Glue the long sides of the paper first, fold nicely over the edge and rub with the plastic card. Repeat on the other long side, then the short sides. (15) If you have painted the inside of your box first or if you don’t care so much about the inside, you are finished. If you want to cover the rest of the inside, cut fitting stripes of paper for the walls and finish with the bottom paper (take the bottom of the box as template and cut the paper 5mm smaller than the marked rectangle. Glue it in and it’s finished. If you have a lid to cover, just repeat all steps of covering the box in the same way. When I use the boxes in my closet, I use them without the lid to store belts, scarves, bras, socks and so on. If your box has a lid, repeat the steps accordingly. You can buy a nice handle or knob to screw onto the box or with a hole punch and hammer add two holes on one side of the box and pull through a beautiful satin ribbon, braided leather, beaded wire or any other nice ribbon as the handle (be creative!). Fix it with knots or glue ends to the inside. You can print your own labels in fancy letters on nice paper with your computer. If you use very expensive or Designer paper keep the off-cuts (triangles etc) for scrapbooking or card making. 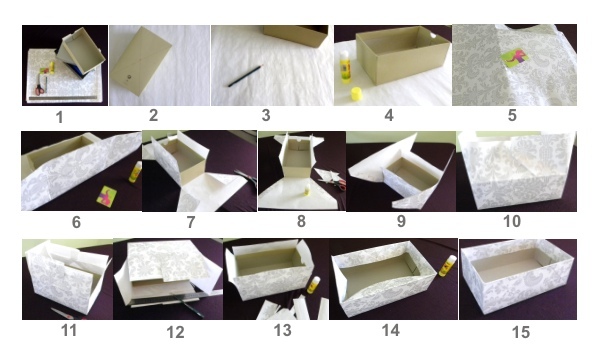 Make it a fun project with your children and let them create their own special box. These boxes also make beautiful gifts for family and friends. Choose paper of colours they like, insert a gift and let them keep the box for photos etc.